I am creating a video for publication as mp4 and to youtube. I painstakingly timed the captions, and have chosen the CC option on the project skin, but captions do not appear when I play the mp4 in Windows Media Player or VLC media player. When I upload to YouTube there are no captions. All 3 of these are in need of an srt file. How do I extract an SRT file from Captivate? If I can’t do that, how do I get the captions to appear, even if they are Open Captions (burned in). I need to be able to do this!! 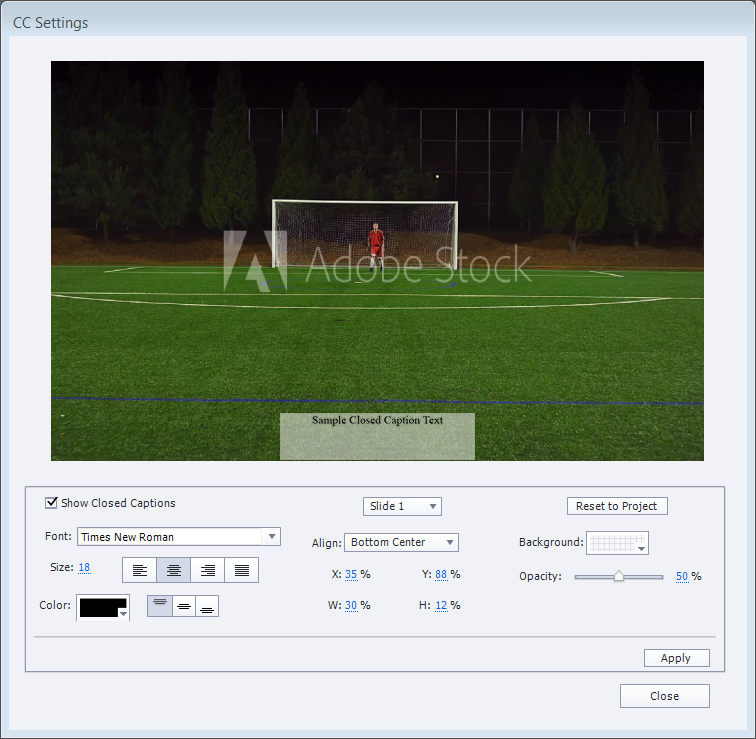 The closed captioning in Adobe Captivate is only for when the project is published for Flash or HTML5. Elements like Closed Captioning are not converted when published for video (MP4). The good news is that when you upload your video to YouTube, part of the processing they provide includes converting your audio to Closed Captions. Be forewarned that sometimes they get the words wrong but you can edit the Closed Captioning easily within the YouTube interface. Is there a way to display captions for audio on the slide as well as for the video? For example, I have audio for a 30 second slide that I added captions for. However, say, at 15 seconds I show a video for the remaining 15 seconds. I want to show the slide audio captions for 15 seconds and I thought the video would show its own captions that I added from then on – but the first 15 seconds are blank until it gets to the video captions. Why cant we import the captions by using a SRT file? This would save hours of work. Can I preview my closed caption without previewing in a browser? Need advice. Changes made in Project skin appear in project preview mode but do not reflect in the published mp4 file. I am trying to include CC option. I have also checked the settings and tried to play the file in Windows Media Player and Quick time, but could not get the play bar as set in project skin. Can closed caption have centre alignment instead of left? 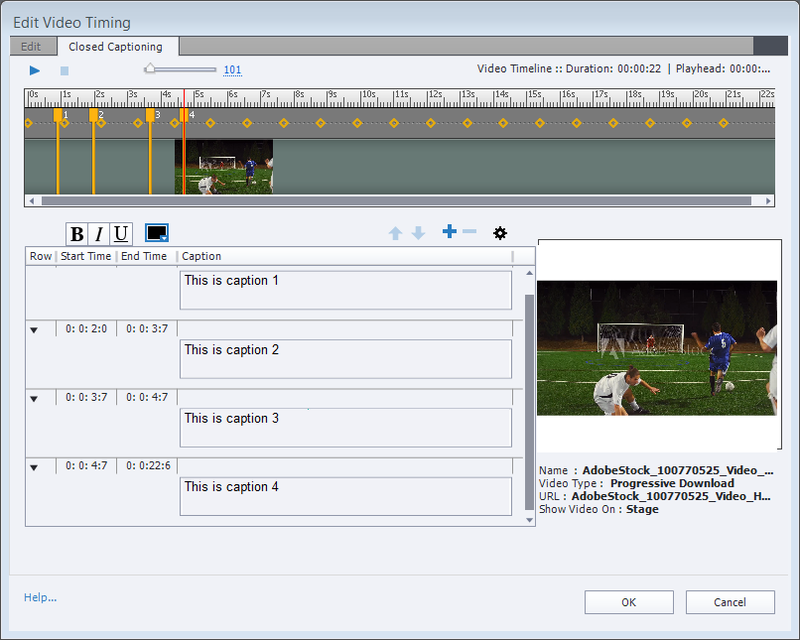 Even when running as administrator, Captivate 7 does not include the closed caption text entered via the video edit timeline option in exporteded project captions and closed captioning. This must be a bug of some sort. The feature is great for translating CC into other languages, but it won’t work for video CC text. Has anyone tried this in Capitivate 8 to see if it was fixed? Is it possible to import a pre-existing caption file (like .srt or .scc)? What format is preferred? What if I want to export the closed captions attached to video? I have some done like this and when I go to File–>Export–>Project Captions and Closed Captions I get a message that there are no captions. What if you have audio in the slides and import video, do you have to duplicate your script in the closed captioning and in the slide notes? Or can you link them? Is there a way to import a transcript, instead of typing each caption individually? Can this be done in Captivate 5.5 version as well? Yes, this works in Captivate 5.5 as well. Would LOVE to see a video on this Dr Jaisingh! I have a huge MP4 with CC and it is not working for me. It is only picking up the captions in my quiz, not in the video. I created a Video Demo in Captivate. When I tried to insert the video into a project .cpvc was not listed. So how do I put closed captioning into a .cpvc video? You can publish you CPVC project as an MP4 video and then get it in a CPTX project to add closed captions. Thanks. I did that and got a nicely captioned video. However, when I clicked on the Export Project Captions and Closed Captions, I got a message that there were no captions to export. I’m using Captivate 7. Try opening Captivate in Admin mode and then export captions. Right-click Captivate 7 icon in start menu and select Run as administrator. Alas, that did not work. Stephanie, in CP7 you can add cpvc-slides directly, you don’t have to publish them as mp4 and insert as video. As a bit more information, I work in an environment with many deaf people. Thus everything that I create must have functional closed captioning, thus the information that I seek about centering closed captioning is an important one in my work situation. Thank you for any information. The closed captioning standard is to have the captions centered. Is there a way to center the captions within Captivate? where do the closed captions appear? I don’t seem to be able to enable the display of closed captions during playback. To enable the display of closed captions in the published projects, go to Project > Skin Editor, and select Closed Captioning. I’m also having the same issue with the CC. I enable the CC in the Project Skin Editor, add CC to the audio, enable CC in the player, but it doesn’t show up. I’m using Captivate 7. Hi Saji, you can enable CC for your entire project by setting the slide enter action for first slide as Assign cpCmndCC variable with a value of 1. Hi Vanitha, currently it’s not possible to change the position of CC. We are considering it for future updates/releases. Just curious, how are you doing it in HTML5? I added the below lines in CPLibraryAll.css and it works..